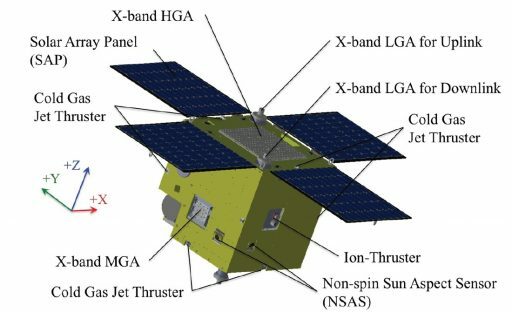 PROCYON – the Proximate Object Close Flyby with Optical Navigation spacecraft is a project of the University of Tokyo and the Institute of Space and Aeronautical Science of the Japanese Aerospace Exploration Agency. 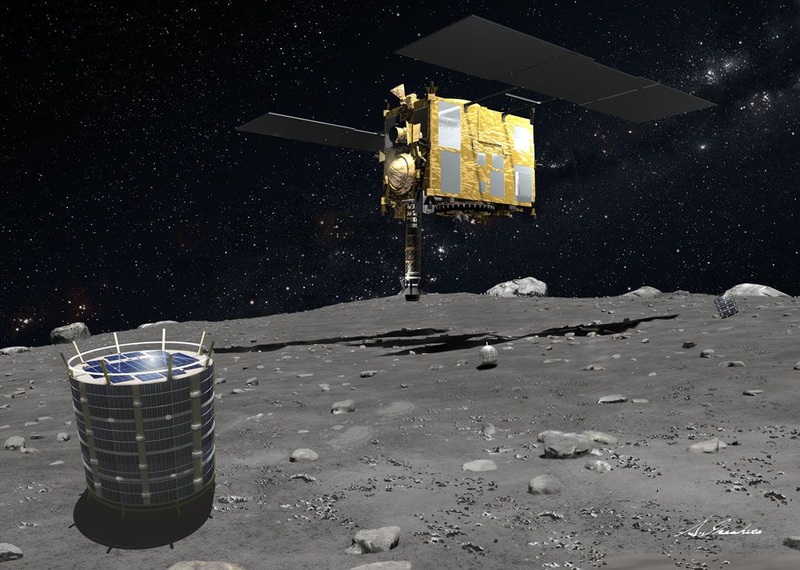 The 67-Kilogram spacecraft aims to demonstrate a small satellite bus for use in deep-space missions with special focus on propulsion, testing out a miniature ion propulsion system and Earth-flyby trajectories to set up for at least one asteroid flyby demonstration. 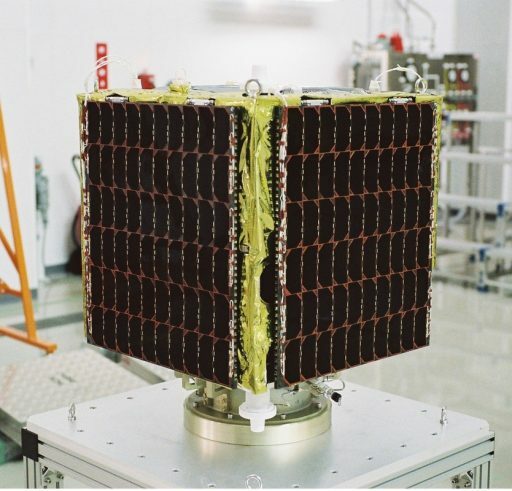 The PROCYON satellite uses a standard 50-Kilogram microsatellite platform employed in a number of previous Japanese Low Earth Orbit missions – only the COTS-based communication system and the propulsion system are modified to create a deep-space flying spacecraft. Overall, the satellite bus measures 0.55 by 0.55 by 0.67 meters in size using external and internal composite panels and an aluminum framework providing structures for the installation of the various satellite components. 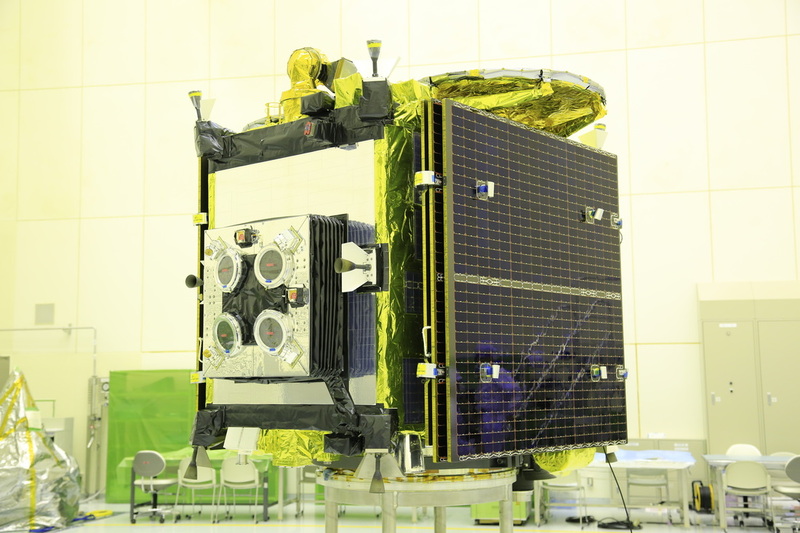 The satellite uses four deployable solar panels facing the +z direction that will be pointed to the sun during nominal mission phases for optimized power generation. The panels deliver power to all satellite systems, distributed by a dedicated system that conditions that satellite’s 28-Volt unregulated power bus and controls the state of charge of the onboard battery. The majority of power will be used by the ion propulsion system. The spacecraft uses a single star tracker for attitude control, acquiring images of the sky that are put through an onboard processing algorithm to identify known star patterns from which the precise three-axis orientation can be calculated. Coarse Sun Aspect Sensors installed on the external panels of the satellite are used to identify the solar vector in order to properly point the solar panels to the sun in case of a spacecraft safe mode. A three-axis Fiber Optic Gyro delivers precise measurements of body rates that are used during rate dampening before the Star Tracker can acquire tracking and the FOG is also used to measure acceleration from the propulsion system. Attitude Control is provided by four reaction wheels that provide redundant control about all three axis and can tolerate the failure of one wheel without losing attitude control capability. The reaction wheel assembly is a rotating inertial mass that is driven by a motor that spins the wheel. When accelerating the wheel, the satellite body to which the wheels are directly attached will rotate to the opposite direction as a result of the introduced counter torque. Momentum dumps from the wheels are accomplished by spinning the wheels down and countering the resultant force using the satellite’s unified propulsion system. The spacecraft uses an X-Band communications system suitable for deep space communications, comprised of a single High-Gain Antenna, a Medium Gain Antenna, and four Low Gain Antennas – two for uplink and two for downlink. The communication system consists of an X-Band Transponders, a 15-Watt output Solid State Power Amplifier system, a tone generator for ranging, diplexers and bandpass filters. The High Gain Antenna is a flat patch antenna installed on the +z panel of the spacecraft and has a small operational boresight while the MGA that resides on a side panel has a large cone and the LGAs deliver omni-directional communications. The X-Band system operates at a frequency of 7.1 GHz for command uplink and 8.4 GHz for telemetry and data downlink that reaches a data rate of 32kbit/s using the High–Gain Antenna and drops to 8bit/s on the Low Gain Antennas. Uplink data rates can be selected between 15.6, 125 and 1,000 bit/s. The communication system should be operational up to a range of 2 Astronomical Units. 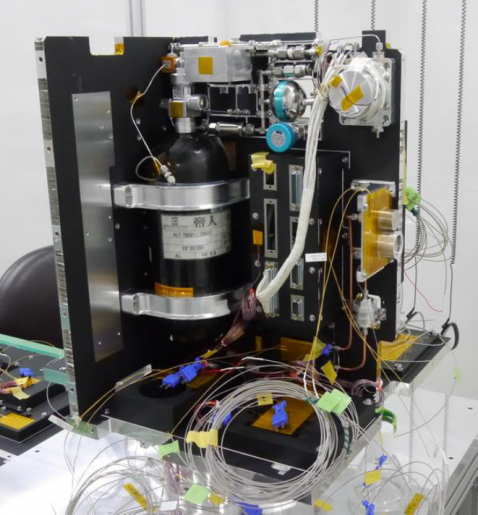 On the ground, Japan’s 64-meter Deep Space Antenna and a smaller 34-meter antenna in Japan will be used to communicate with Procyon with support from 70-meter Deep Space Network stations during critical mission phases such as flybys. 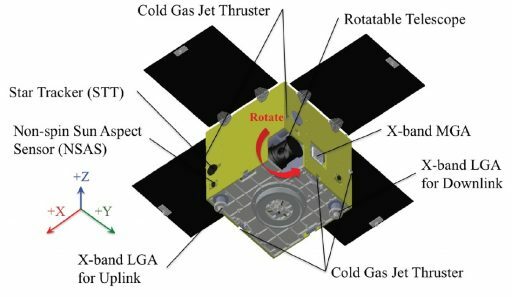 The primary system to be put to the test as part of the Procyon mission is the I-COUPS – Ion Thruster and Cold-Gas Thruster Unified Propulsion System. As its name says, the system uses a unified architecture – feeding its cold gas thrusters from the same tank the Ion Thruster receives its propellant from. This design approach reduces the mass of the system. Overall. I-COUPS weighs 9.5 Kilograms including 2.5 Kilograms of Xenon propellant held at a pressure of 80bar in a 2-liter High-Pressure Gas Tank. I-COUPS consists of the following main components: an Ion Thruster Unit ITU, a Cold Gas Thruster Unit CTU, a Power Processing Unit PPU, a Gas Management Unit GMU and an I-COUPS Control Unit ICU. The Gas Management Unit controls the flow of Xenon gas to the cold gas thrusters and the ion thruster, two systems that operate at very different pressures. The tank of the vehicle has a dry mass of 1 Kilogram, consisting of aluminum alloy capable of tolerating pressures of up to 19.6 MPa. The GMU uses a two-stage pressure regulation to be able to deliver gas to the different propulsion systems at the appropriate pressures and mass flow rates. High-pressure Xenon coming from the tank is regulated to 3 bar by a pre-fixed mechanical pressure regulator. The gas line is then divided to the ITU and CTU. The 3-bar gas is further regulated in the ITU to reach the appropriate pressure of 0.3 bar by using a solenoid valve and pressure sensor with an accumulator between the valve and the ITU to extend the control period. A flow restrictor connects the ITU to the accumulator. 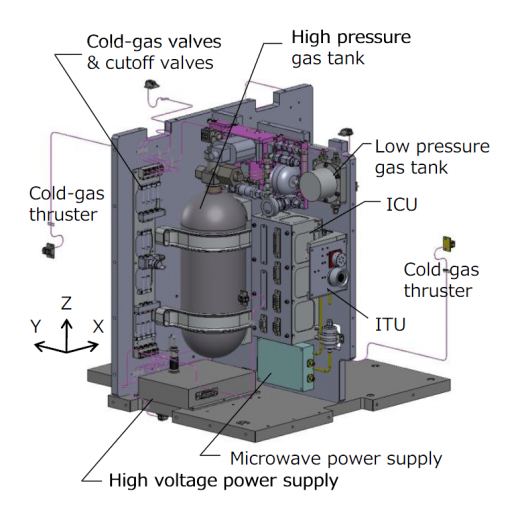 The Cold Gas Thruster Unit consists of cold gas lines that are leading to the eight cold gas thrusters that are installed to be able to provide three-axis control of the spacecraft. Each of the thrusters consists of a conical aluminum nozzle and a gas inlet port with and electrically controlled thruster valve in the line to the thruster. Thrust is generated by simply allowing pressurized Xenon gas to flow outside the thruster, creating an opposing force on the spacecraft according to Newton’s third law. A thruster assembly weighs under 25 grams. The thrusters are divided into two groups of four that include redundant cut-off valves (two per string) to isolate each group individually in case of propellant leaks or opened thruster valve failures. All 12 valves of the cold gas thruster system are installed on a single plate from where tubes of 20 to 110-centimeter length run to the individual thrusters. Overall, a single cold gas thruster used on PROCYON delivers a nominal thrust of 30 millinewtons with a mass flow rate of 90mg/sec and a propellant pressure of 3 bar. The thruster operates at a low-specific impulse of 24.2 seconds given the low propellant pressure and the type of propellant that is used. 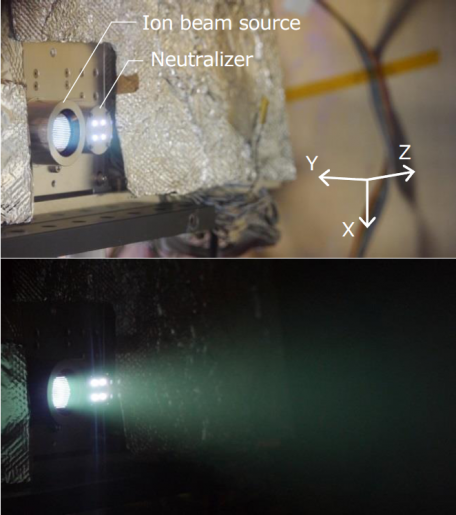 The Ion Thruster Unit consists of an ion source, a neutralizer, a thruster valve, a gas distributor, gas isolator, DC blocks, and ion accelerator. Like its bigger sister Hayabusa, PROCYON uses a electron cyclotron resonance ECR microwave discharge – a new design that eliminated solid electrodes and associated heaters that were used as part of previous systems. The thruster operates by releasing small amounts of Xenon atoms that are then ionized using the ECR which is also used to feed the neutralizer that emits electrons near the exiting ion beam to ensure that equal amounts of positive and negative charge are expelled, thus preventing the spacecraft from gaining an excessive electrical charge that could damage components. A four-grid system is used to extract the generated ions (first two grids) and accelerate them to extremely high speed for ejection (last two grids). The ejected ions push the spacecraft in the opposite direction according to Newton’s Third Law. The out-streaming ion beam is neutralized using electrons that are ejected from a four-holed orifice. The ion thruster delivers a nominal thrust of 0.25 millinewtons at a high specific impulse of 1,000 seconds which clearly illustrates the difference between chemical and ion propulsion as the chemical propulsion system generates a higher thrust but much lower impulse at a much higher propellant consumption but significantly lower electrical power requirements. 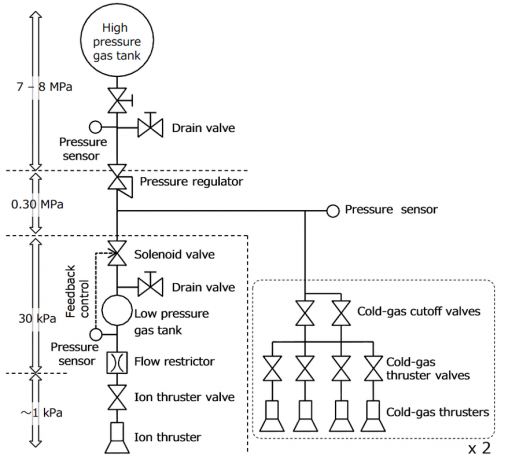 For PROCYON, three types of propulsion are required: reaction control for momentum dumps – done by the cold gas thrusters, high delta-v accumulation for trajectory setup – done by long operation of the ion thruster, and Trajectory Correction Maneuvers for flyby targeting – done through short operation of the cold gas system. The I-COUPs propulsion system includes its own Power Processing Unit to deliver power to the different systems. 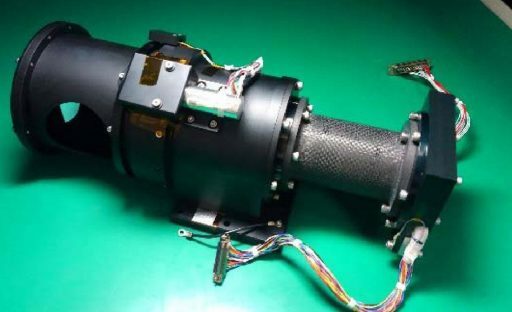 The ion thruster requires high-voltage power for the ion accelerator, a microwave power source and power for the neutralizer. Three different High-Voltage Power Supplies are used – the Screen Power Supply, the Accelerator Power Supply and the Neutralizer Power Supply. All supplies operate from an unregulated 28 (+/-4)-Volt power bus to generate voltages of 1,500V (Screen), -200V (Accelerator) and up to –100V (Neutralizer). The Microwave Power Supply delivers 1.4W of microwave power to the ion source and an identical output is delivered to the neutralizer. MPS includes a 4.25 GHz oscillator to generate the microwave frequency with amplifiers, dividers and isolators delivering the microwave pulses to the ECR systems. All power supplies, regulators, valves and sensors of the I-COUPS propulsion system are controlled by the I-COUPS Control Unit that interfaces with the onboard computer of the satellite from which it receives all commands to open/close valves, and switch the power supplies on and off. The ICU receives all sensor outputs in analog form and puts them through analog to digital conversion before delivering the telemetry to the onboard computer that then processes the data to send the appropriate commands to actuate systems as needed. The PROCYON satellite is equipped with an optical telescope that will be used as an optical navigation sensor during proximity operations near the target asteroids to provide data for attitude maneuvers needed to keep the asteroid within its field of view to also capture scientific imagery of the asteroid’s surface. The telescope uses a rotating scanning mirror receiving light from a 5 centimeter aperture. The telescope has a focal length of 15 centimeters. PROCYON launches with no specific asteroid target. A number of potential flight trajectories have been identified, but the selection of a final target will depend on the vehicle’s actual insertion trajectory since the propulsive capabilities of the spacecraft are limited. A precise trajectory fix will be obtained through Delta-Differential One-Way Ranging supported by the X-Band payload. After a target is selected, PROCYON will either follow a direct flight to the asteroid in a transfer lasting up to two years or choose an Earth flyby profile. In this scenario, the spacecraft would use its ion thrusters for half a year in its heliocentric orbit for a total delta-v up to 100m/s and a Xenon consumption of 0.6kg to set up a flyby trajectory that delivers the vehicle to its target asteroid within one year. 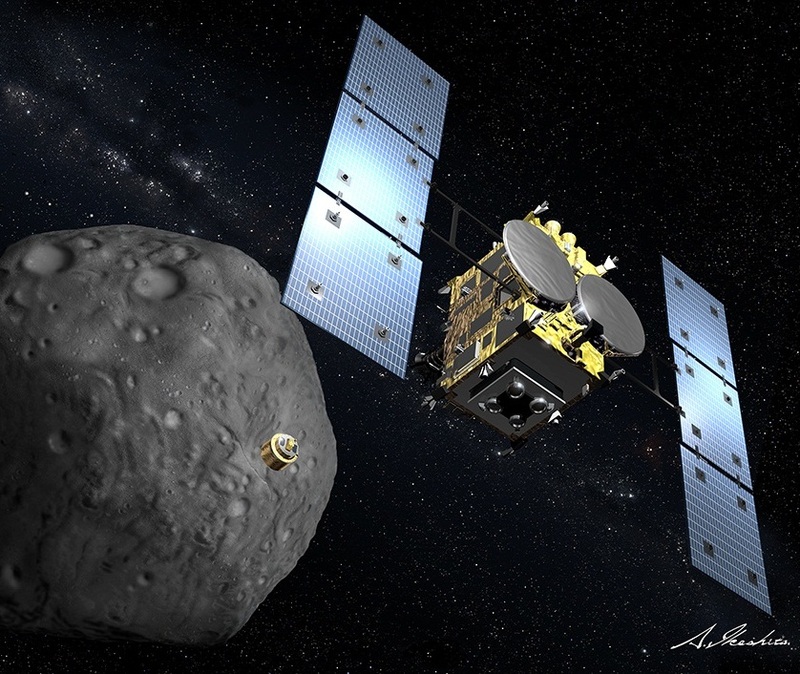 After the close asteroid flyby at a distance of around 50km and a relative velocity up to 10km/s, targets for a possible extended mission will be identified based on propellant availability.